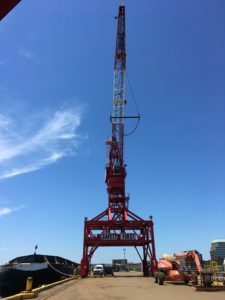 The crane that is utilized when unloading cargo ships at one of Connecticut’s ports is powered by a generator located over twenty feet in the air. This critical piece of equipment is powered by a Kohler diesel generator. Unfortunately, after many years and over 2800 hours of use, the main alternator failed taking the crane out of service. Tower Generator quickly responded and replaced the damaged parts. Ships come in on a regular basis and unloading must go on as scheduled. Thanks to Tower Generator’s capabilities, the generator went back online before the next ship arrived.